It is impossible to underestimate the popularity and ubiquity of the Brazilian novela (soap opera). Wherever you go in the country, at any time of day, you are likely to come across a television showing one of Brazil’s countless drama series—an institution so popular that midweek soccer matches are forced to begin at the awkward time of 9:45 p.m., just to accommodate the novela. However, in such an ethnically diverse country as Brazil, racial representation on these prime time television spectacles has always been incredibly poor. In recent years though, positive changes have been seen. According to recent census data, just over 50 percent of Brazilians declare themselves as being black or mixed-race. However, watching 30 minutes of terrestrial Brazilian television, you’d think the country is overwhelmingly white. Black faces on national TV are still tragically rare. Moreover, when black actors do feature in these multi-million dollar novelas, they are almost always cast in subservient roles, such as maids, janitors and criminals. Besides the prejudiced representation on screens, there have also been several instances of blatant racism in the history of the Brazilian novela. One of the most prominent cases was in 1994’s Pátria Minha (My Homeland), where in one particularly harrowing scene the character Raul Pelegrini (played by actor Tarcísio Meira) berated and racially abused his black servant Kennedy (played by Alexandre Morenno). The novela was subject to numerous complaints from Brazilian black movements for the terror and submissiveness of the abused servant, in an exchange which harked back to old master and slave relations. 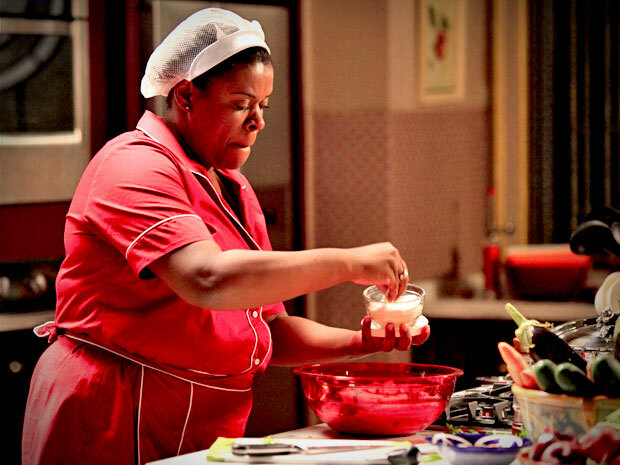 More recently, Brazilian actor Taís Araújo became the first black woman to be given the leading role in a novela when she starred as Helena in 2009’s Viver a Vida (Live Life). While this was an important step, Araújo’s character was strangely marginalized throughout the novela, despite her top billing. One particular scene, in which Helena was violently assaulted by her white counterpart, gathered similar complaints to those for Pátria Minha. Brazilian society has changed drastically over the last 15 years. During the government of former president Luiz Inácio Lula da Silva, millions of predominantly black individuals managed to escape poverty and concurrently a new lower middle-class was formed, an ascendant majority non-white group with increased purchasing power. For the longest time, however, this was not reflected on television. Black characters on novelas were still exclusively working-class or impoverished, with servile jobs. Recently, this trend has begun to change, albeit gradually. In 2015, a light-hearted comedy novela aired which starred two black actors, real life husband-and-wife duo Lázaro Ramos and Taís Araújo, cast as a successful pop star, the eponymous Mister Brau, and his businesswoman wife, Michele. The opening episode portrayed the two lead characters moving into their new luxury apartment in Rio de Janeiro and, upon seeing two black people playing in the swimming pool, the couple’s white, upper-middle-class neighbors decide to call security thinking the pair are trespassing. Though filmed in a light-hearted, comedic manner, the scene managed to serve as a biting criticism of the reality of the ascending black middle-class struggling to be accepted. The program has consistently received high audience figures and has now completed three seasons, being renewed for a fourth in 2018. Another important example of increased black representation in novelas came in 2013, with the International Emmy-winning Lado a Lado (Side By Side), which had a large number of black actors in its cast and portrayed early 20th century Rio de Janeiro and the aftermath of the abolition of slavery in 1888. While touching on important themes and including several strong black characters, Lado a Lado was by no means a huge breakthrough, with only a third of the cast being black and many of the protagonists only gaining success due to acceptance or assistance from their white “savior” counterparts. Despite their particular issues, these two examples show how the ethnic makeup of Brazilian television, particularly its prime-time novelas, is beginning to change for the better, becoming gradually more and more representative of modern Brazilian society.